One of the unique offerings of Van Treese Training is our Kinstretch Club. As Park City’s only certified Kinstretch instructor, Ben Van Treese uses his rare and science-based skillset to help all of his clients enhance their physical health and facilitate injury recovery. 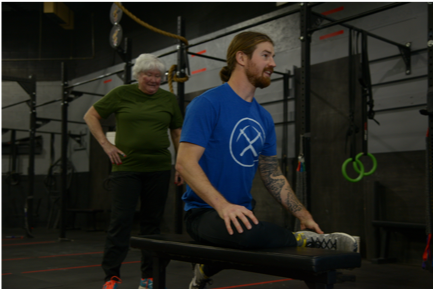 Van Treese Training’s Kinstretch Club is a six-week mobility training club that meets twice per week, and as the name implies, provides an intensive Kinstretch experience. The Kinstretch system is an exercise technique born out of scientific research. All of the movements and training methods have been chosen based on a rigorous and meticulous investigation of evidence as it pertains to body control, joint health, injury prevention, and physical longevity, all based on research by medical and physical conditioning experts. Unique among many training systems, Kinstretch practice incorporates a self-assessment system that allows you to monitor your own body for any dysfunction that may be causing loss of performance, pain, or that may be placing you at an increased chance of injury. All certified Kinstretch Instructors, including our very own Ben Van Treese, are also certified in Functional Range Conditioning (FRC)®. Consequently, they are extremely knowledgeable of biomechanics, human movement, and body control development, enabling Kinstretch instructors to be highly trained in spotting and correcting any dysfunctions in your form as you practice. Your instructor at Van Treese Training knows that maintaining your body’s function often means doing more than a few classes each week. That’s why part of the Kinstretch method is dedicated to doing home exercise assignments to promote longevity and joint health. What are the Benefits of Kinstretch? Centuries ago, Kinstretch did not exist, because it simply was not needed. We as people were much more active in previous generations— in our time, our lifestyles are much more sedentary. Kinstretch solves many of these new problems in human movement and health and is one of the most up-to-date movement systems of its kind.